BuggyTown Candle Company is a tart and soy wax product vendor located in Georgia. 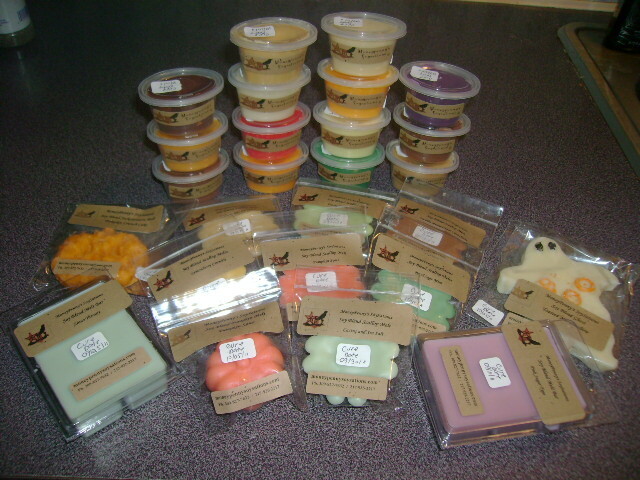 The owner, Chele, started out making wax products as a hobby, but this hobby quickly grew into a successful business. I recently had the olfactory pleasure of experiencing BuggyTown products for the first time, and I wanted to share my thoughts on these awesome tarts with you! My products were very carefully and beautifully packaged. As you can see, there were quite a lot of scents I got! Let me tell you about some of my favorites from Buggytown. Caramel Apple Pecan–So strong! This tart had a great balance of sweet apple and buttery caramel notes. One tart threw scent all day in my open plan living room and kitchen. Mint Chocolate Chip–I surprised myself in liking this tart. To me, chocolate scents are usually very overbearing and don’t smell anywhere close to real chocolate. But this scent is mellow, and you can actually smell the mint notes more than the chocolate. Cinnamon Dolce Latte–This is a very nice, room filling coffee scent. I actually smelled it as soon as I put it in my warmer, before it was fully melted. I didn’t get many strong cinnamon notes but I think that cinnamon and coffee by themselves are such strong scents, that they balanced each other out in this tart. Christmas Hearth— Nice throw. The top note I got was a woody smokiness, with some pine, and a slight indiscriminate fruit in the background. Jack Frost–This is one of my favorite scents from any vendor. BuggyTown’s version had a good throw, and it was mostly mint and menthol I could smell. I love this any time of year. Sleigh Bells–This was one of my top 2 tarts from the package. It’s so strong, and lasted forever! This scent is very unique and I’ve never smelled anything like it. I couldn’t even really tell you the notes I got, though the scent description says it has cardamom, nutmeg, and orange. I didn’t pick out any of those notes definitively, but let me tell you, it’s a great blend. Apple Maple Bourbon–This scent is quite similar to Caramel Apple Pecan, but the apple notes take over more here. Cherries in the Snow–I had been hearing so much about this scent that I was ready to try it, even though I mostly hate cherry scents. I found this actually bearable! There’s cherry but it’s sweet, and really smells more like a berry! Spiced Cranberry–I enjoyed this scent a lot. The color was very bright on the pot once melted. The cinnamon was not too strong but I could detect it a lot more than the cranberry. The one and only caveat I had with BuggyTown tarts is that some of them were quite hard to pop out of their cups. I know that means they were made fresh! You can really tell Chele is a woman who has a passion for her craft, and it shows in her exceptional wax products. Moneypenny’s Soysations is a tart and candle shop based out of Illinois…but of course you can buy their products online too! It is run by one of the sweetest ladies I’ve ever talked to, Angie. I had tried some of Moneypenny’s tarts several months ago, and while the fragrances were OK, the wax was really soft and crumbly. 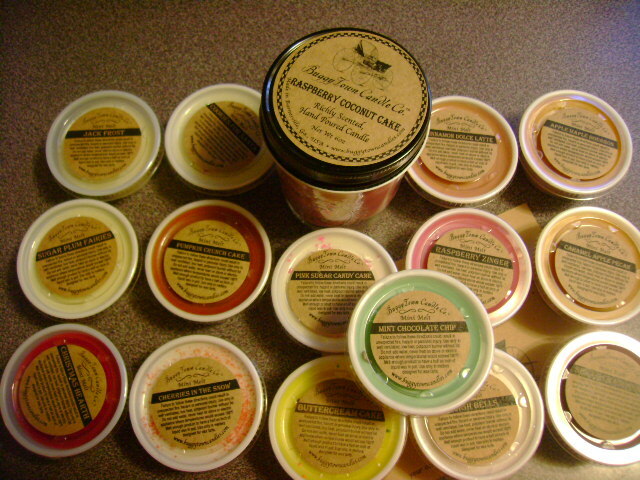 I recently found out that Angie had started using an entirely new blend of wax and had a new and improved line of tarts! I couldn’t wait to try them again, and in really cute shapes too! I got a wide variety of scents to try! Angie puts a sticker on the package of each and every tart, so you know when it has reached its’ full curing time. I really appreciate this, because sometimes with soy and soy blend tarts, you are never really sure when to use them…you want them to give off the best throw they can, but you don’t want to let them sit for too long! 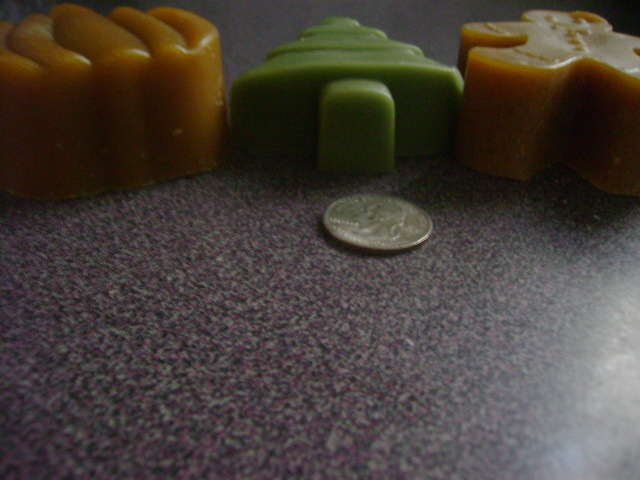 Moneypenny’s main line of tarts is their soy wax cube melts, but they now offer melts in a few other shapes too. 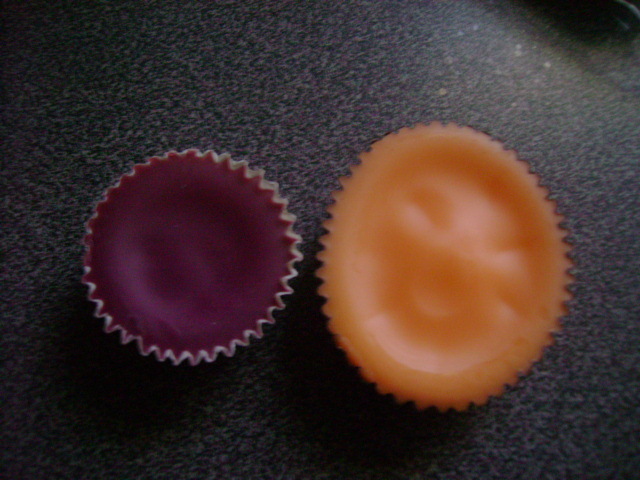 The jack o lantern and pumpkin tarts are the perfect shape for a melter bowl! The ghost is quite large and should probably be broken up or cut before you use it…unless you have a really large bowl! Since there were SO many tarts for me to review, I’m not gonna list each and every one. I am gonna give you the details on my favorite scents from this package! Apple Mango Tango–This is one of my top scents from any vendor, so I really liked this one. It was quite strong without being overwhelming, as some clean scents can be. This Apple Mango Tango seemed a bit different than others I had tried before, but in a good way. The apple seemed to really stand out to me in this blend. Frosted Lime Cupcake–I really, really, really love lime bakery scents, and this one did not disappoint. You can definitely smell the zesty lime, on a vanilla cake background. No trace of “floor cleaner” notes that some limes and lemons can have. Blueberry Muffin–Wow, this is a STRONG fragrance. A very classic blueberry muffin scent-sweet blueberries with a bakery background. Pretty much anything blueberry is alright with me, and this was great. Caramelized Pear–I believe this is one of Moneypenny’s top sellers, and I can see why. It’s a very cozy scent for fall. I liked that the caramel and pear notes were equal in this scent–sometimes when you have any caramelized scent, the caramel notes are very hard to detect. This is somewhat like a caramel apple scent, but a bit more earthy. Pumpkin Pie Spice–I liked this scent not because it was knockout strong, but because it was so different than what I was expecting it to be. Usually when you melt a pumpkin pie fragrance, you expect it to be overwhelmingly cinnamon-y. In this blend I detected clove as the top note, and I really love that about it. It’s still a great fall fragrance, and it’s not in your face with the cinnamon. Toasted Marshmallow–Well, one ounce of this tart was not just a room filler, it was a whole HOUSE filler. I honestly put this in the melter in my bedroom at one end of the house, and before long I could smell it from 3 rooms away. Very powerful and delicious. This is a very sweet, mouthwatering fragrance. It will make you want to bake something or eat something sweet! Lemonberry Crumble–This is a sweet, not tart, bakery lemon with a background of berries…not sure what berry, it may be strawberry or raspberry or something in between. But this is one of my favorite scents from Moneypenny’s, and it’s definitely very original. 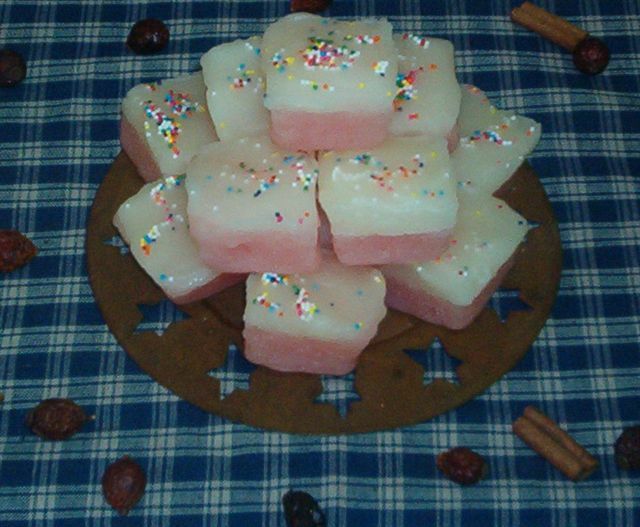 Pink Sugar–Yall all know how I like pink sugar, but I so rarely ever melt it just plain! I’m not sure why, but I know now I want to more often. This PS was true to the real thing, and my husband claimed it almost knocked him out when he walked in the door while I was melting it! Citrus Sunburst–I’m not usually into orange type scents too much, but this one was different. My husband is in love with this scent. I think it’s because of the tangerine and kumquat notes in it…his grandmother had a kumquat tree in her yard and he ate and picked many. This lasted all day for me! I am so glad that Moneypenny’s Soysations has been changed for the better. Some vendors are so offended when they hear bad things about their products, but others take it upon themselves to make their products better. Angie has done this beautifully. The wax in the clamshells is much harder now, and not at all crumbly! It pops right out. If you haven’t tried Moneypenny’s yet, or if it’s been a while since you have, I highly recommend giving them another go! Angie ALWAYS offers free shipping on orders of $25 or more! 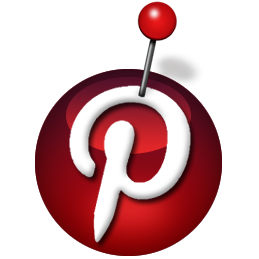 OhSoySweet is a darling little Etsy shop that makes handmade, handpainted sachets, potpourri, and of course tarts. But where the owner’s (a sweet lady named Jennifer) creativity really shines is in the scent combinations she comes up with and puts into wax form. Sweet Cherry Mint Zinger, Honey Spearmint Tea, and Tomato Leaf Herb Garden are just a few of the unique scents OhSoySweet has to offer. The tops of the little tarts are adorably decorated to correspond with their scents. Jennifer has been making tarts for about a year, so she’s still pretty new compared to some other tried and true tart vendors. But she is full of ideas and inspiration! I was very pleased to be able to get the chance to review of some OhSoySweet’s tarts. The generous package I received! Jennifer is so nice, she even sent me a bag of her potpourri and a one-of-a-kind fragrance sachet. 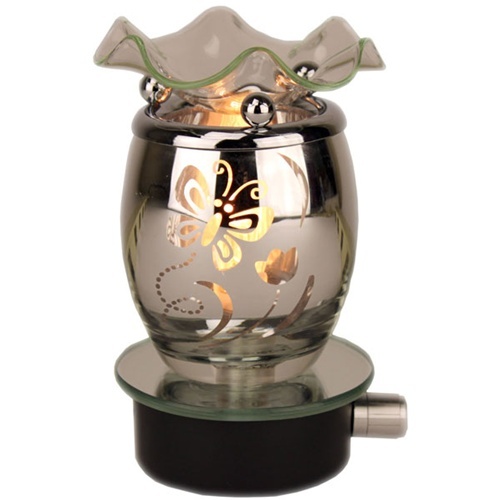 The potpourri was scented in Eucalyptus Sweet Mint. Eucalyptus just happens to be one of my favorite scents–it is soothing to me. I decided to put it in a glass bowl in my bathroom, so I could smell it while I showered. It scented my bathroom, and then some! 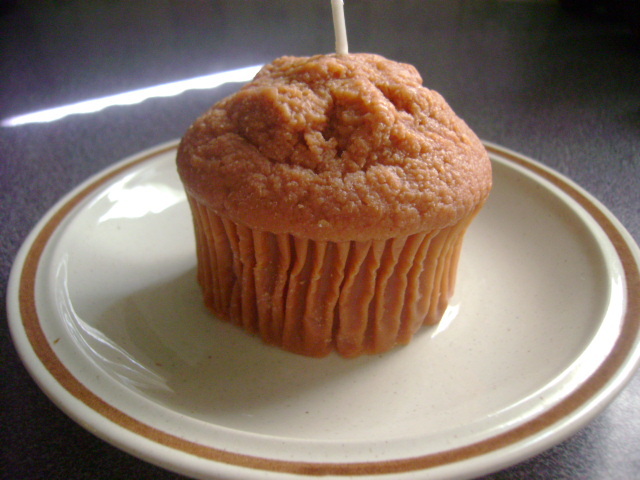 The sachet was large, and scented in Orange Cream Cupcake. I put it in my walk in closet! Look at how gorgeous these tarts are! Now, normally I am very wary of melting any tarts with “stuff” on them–sugar, sprinkles, glitter, etc. I use a higher wattage bulb in my warmers, and sugar sprinkles have caramelized in the bottom of my bowl before. Luckily that did not happen with any of these tarts! I always pour my wax out of the bowl while it’s still liquid, and everything these tarts were topped with came sliding right out with the melted wax. As the name implies, OhSoySweet’s tarts are 100% soy. Here’s the details on the tarts themselves! Crisp Cucumber Mint–This was a light, spa type scent. I mostly smelled the mint but there were some green watery notes there too, from the cucumber. Blueberry Butterscotch Brulee–For being such a small tart, this was pretty strong! Blueberry is the top note, which is usually the case with any blueberry blend, but under that you get a caramelized butter scent too. I really liked this. Christmas Candy Cane–Peppermint or candy cane is always one of my top fragrances any time of year. The cold throw on this tart was promising, but when I melted it, I got mostly menthol notes. Maybe a little more cure time would have done this one good? Dulce de Leche Caramel Cheesecake–This was not a knockout strong scent, but I could still smell it from across the room. This is a very sweet caramel with a milky background. Strawberry Rhubarb Pie–I wasn’t really expecting to like this tart too much, but I did! This was a weird tart in that I could barely smell it when I was close to it, but from the next room it was stronger. This is a fresh, not too sweet strawberry. The combination of the rhubarb gives this tart an earthy note, which I surprisingly liked. Jennifer has let me know that she does plan to open a non-Etsy, independent storefront sometime in the future. Also, keep your eyes peeled for upcoming holiday items and sales from her shop! 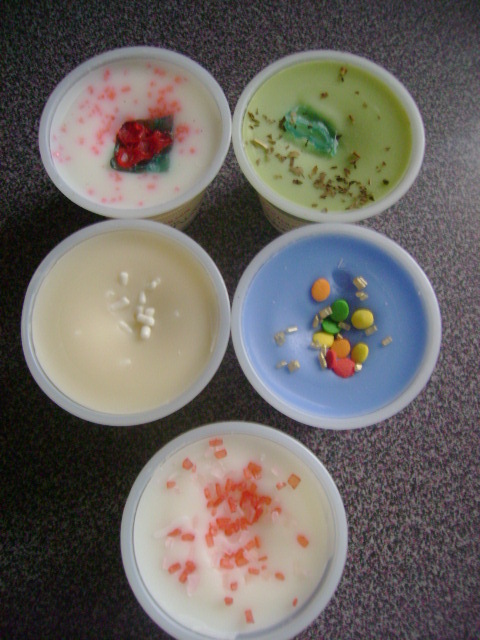 Sweet Light Candle Co. is a company based out of Florida that makes unbelievably realistic dessert candles and melts. 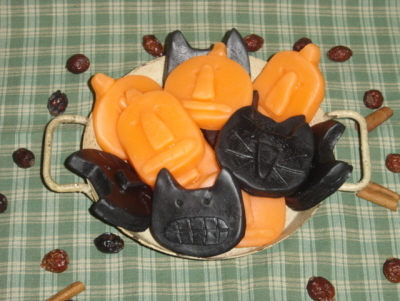 The shop also offers dessert shaped soaps, tealight candles, and tart burners. 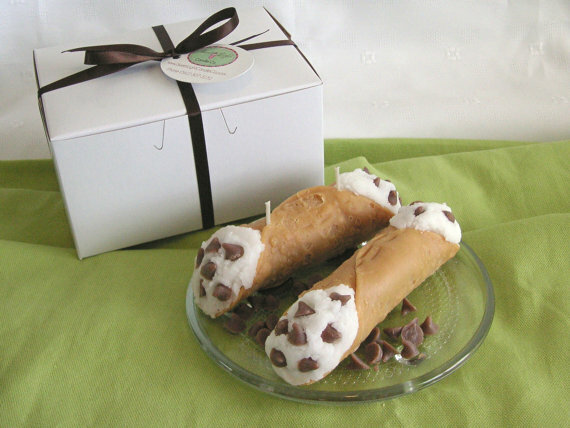 When I first visited the site, I saw these unique, looks too real to be wax, cannoli shaped tarts! In addition to making me hungry, they made me want to give Sweet Light Candle Co. a try. 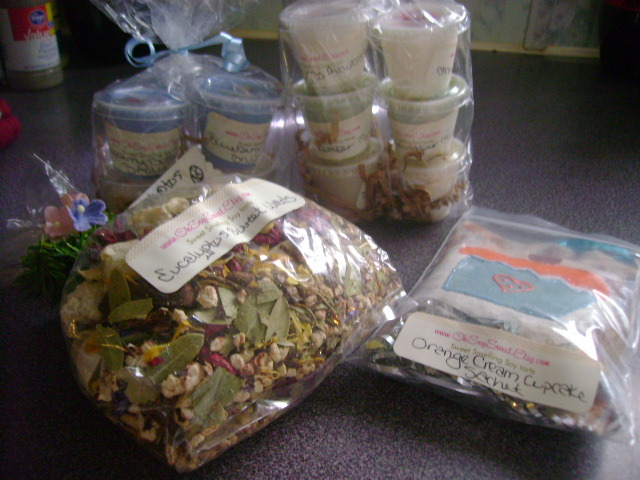 The owner, Dina, sent me a selection of products to review. 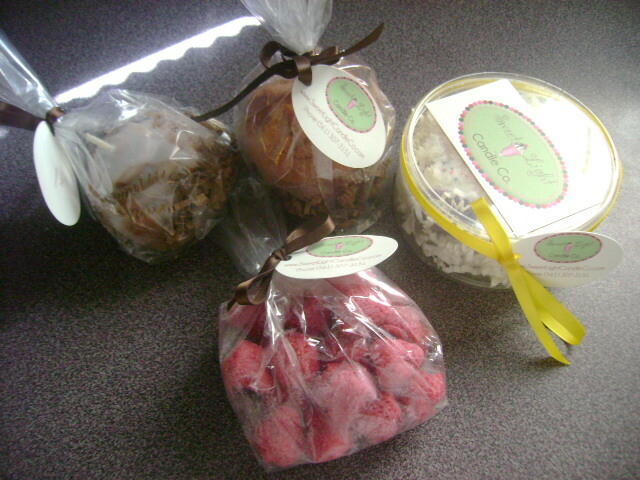 I received a Cinnamon Bun candle, a Pumpkin Spice Muffin Candle, Gumdrop Mini Cupcake Melts, and Wild Strawberry Melts. The first thing I noticed about these items was that the attention to detail in these products is second to none. 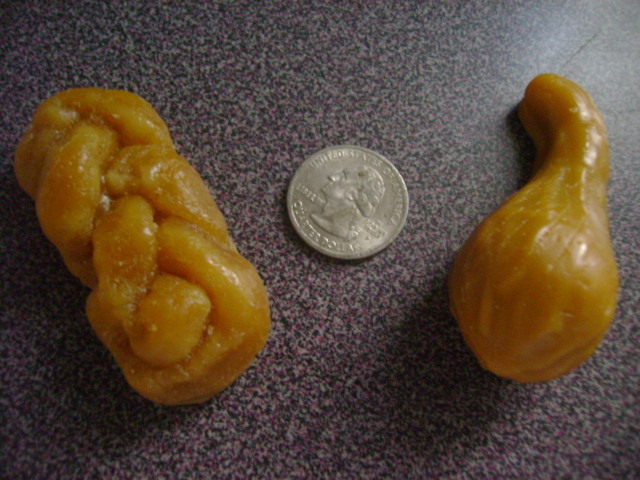 These are beautiful wax pieces. This candle was lovely and had a good cold throw, but its’ throw when melting was quite light. I could smell it when I got within about 3 feet of it. I melted this on the plate all day, about 10 hours, and it still had some wax left to burn the next day. Gumdrop Mini Cupcake Melts–These are so adorable, and the “frosting” on them is hand sculpted. They are a nice size, over an ounce each. It seemed one melt took a little longer than usual to fully liquefy in my melter. Sweet Light Candle Co. wax is a blend of paraffin and vegetable waxes, so I’m not sure why that was so. To me, this gumdrop melt smelled like sweet grape candy. The throw was not knockout strong, it was more light to medium. But the scent lasted for hours. 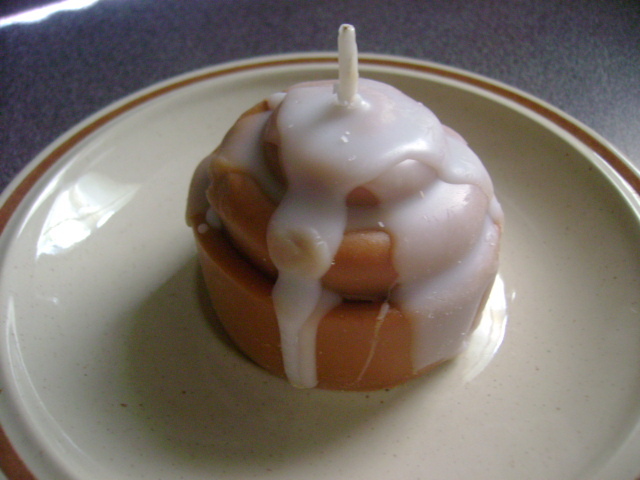 Cinnamon Bun Candle–There’s not many foods I love more than a warm from the oven cinnamon roll covered in dripping frosting. This candle definitely smelled and looked like the real thing. 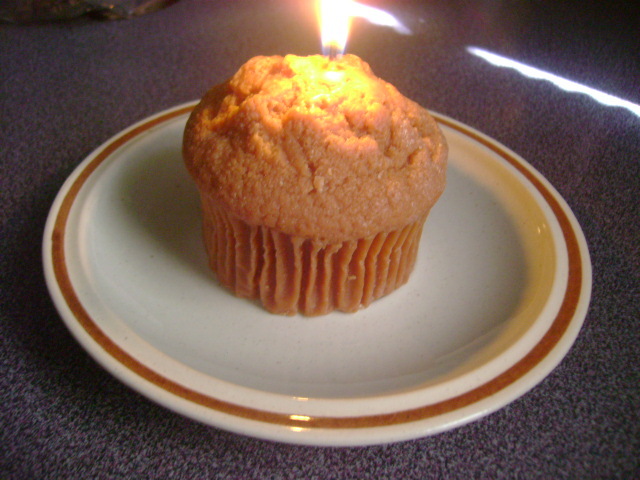 The cinnamon bun candle was quite a bit smaller than the muffin candle, so it melted for a shorter time. But I got a bit more throw out of this one than I did the larger candle. Not a room filling scent, but pleasant nonetheless. 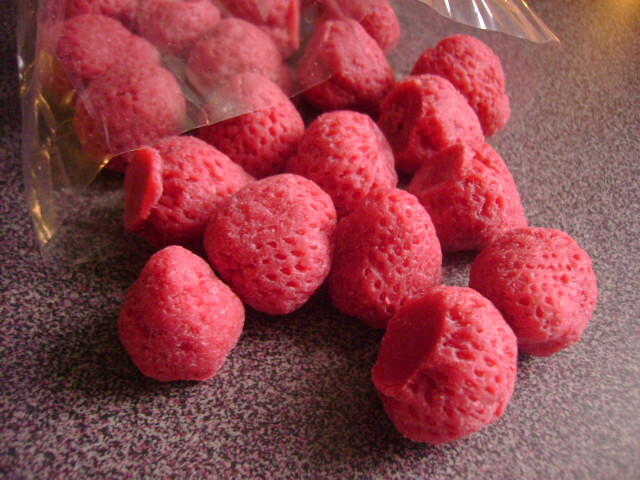 Wild Strawberry Melts–These are teeny tiny enough that I put 6 into my melter. These were my favorite item out of all that I tested. The throw was medium, not overwhelming but I could smell it from quite a distance. The fragrance is sweet, sugary fresh strawberry. I let these melt for about 6 hours before I threw out the wax. I think adding more strawberries to the dish would give a better, longer lasting throw! Sweet Light Candle Co. is worth a try if you are someone who likes your candles to look as realistic as possible! I know some people like to purchase candles as decor, and these would be perfect for that. If you want something that smells as good as it looks, go for the melts they offer. 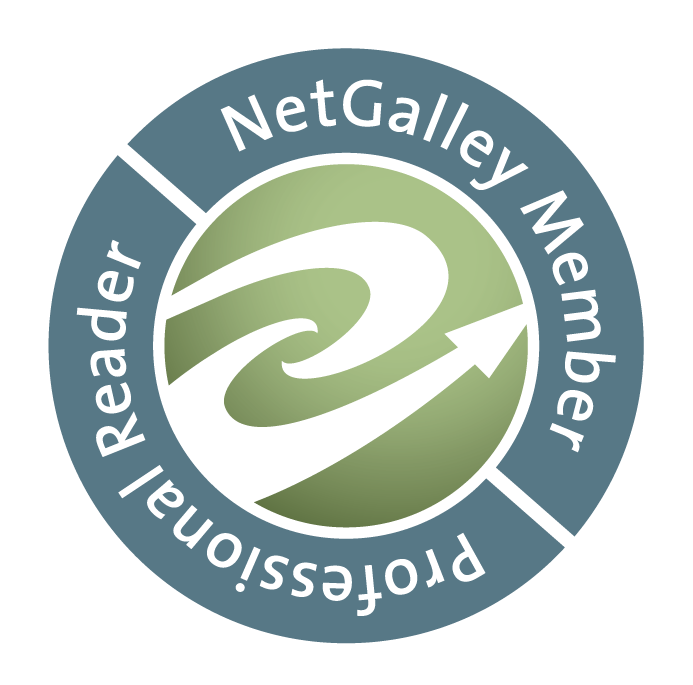 SLCC has an affiliate program, and also loves to do wholesale orders! If you guys were reading the blog earlier in the month, then you’ll remember that Shayz Scentz is the October featured vendor. 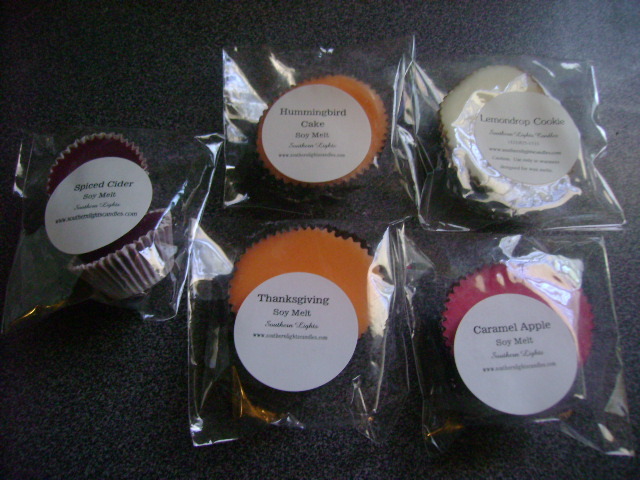 Shannette sent me some of her newest Fall and holiday tart shapes and fragrances to share with my readers! Just another shot to show how thick they are! 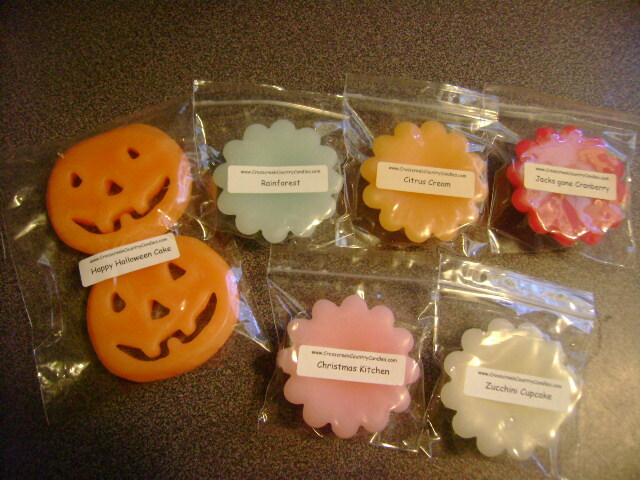 Some of the Fall and Winter fragrances at Shayz Scentz are Dickens Christmas, Pumpkin Zucchini Bread, Cornbread, and Minty Mints. 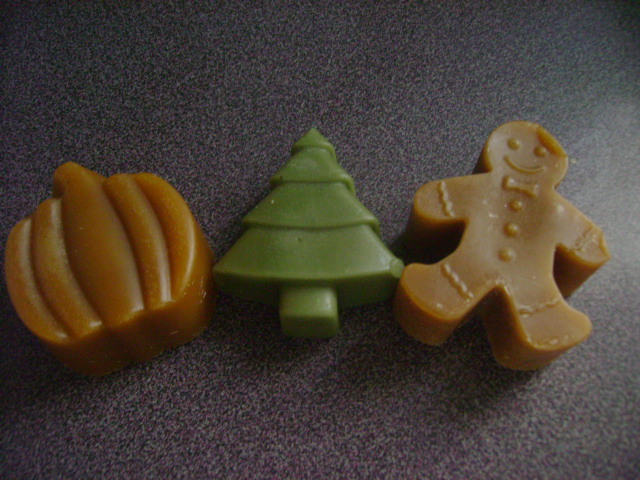 A couple of great Fall scents I have tried are Gingersnap and Spicy Cornbread. Gingersnap is a very strong gingery, spicy scent. If you’re looking for a sweet cookie fragrance, this is not for you! I’d recommend it for true Gingersnap lovers who want to be reminded of their favorite snack. Spicy Cornbread is so very unique. I’m really not even sure how to describe it. It was buttery but not sweet, spicy but not cinnamon-y at all. It threw strongly for more than 12 hours! I really loved it. 2. 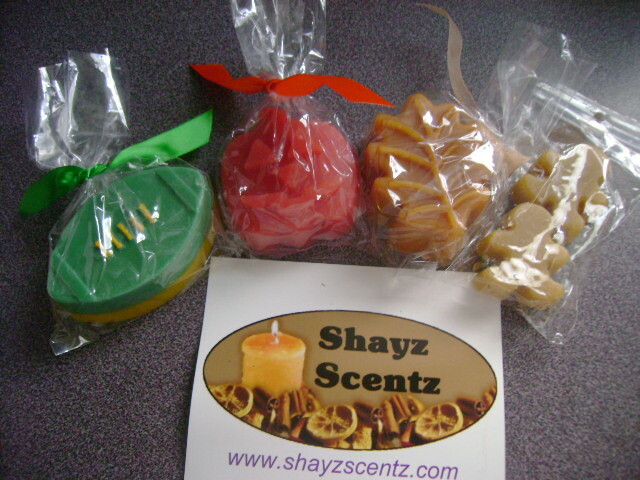 Like the Shayz Scentz Facebook page and make a post saying I sent you. 3. Like the Sweet Southern Home Facebook page and post that you’re entering the contest! 4. 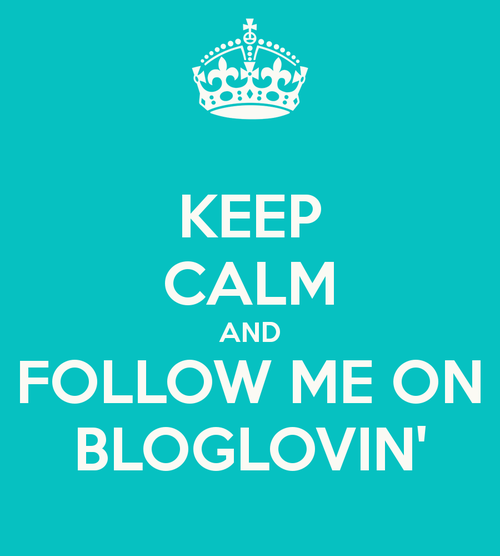 Follow this blog through Networked Blogs or email. 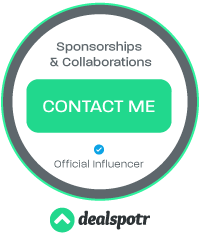 Both links are located on the left sidebar. 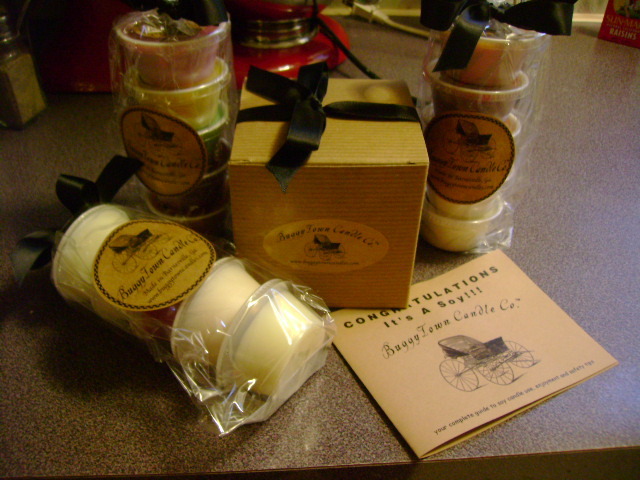 Crosscreek Country Candles has been in business for ten years, and is based out of Ohio. The owner, Deana, is such a sweet and funny lady and she just makes you love talking with her! Crosscreek offers wax tarts in hundreds of awesome fragrances, with some of the most delicious original scent creations I’ve seen from a vendor. You can tell Deana really loves mixing fragrances and coming up with something new. The tarts come in cups, scallops, and adorable prim and bakery shapes. 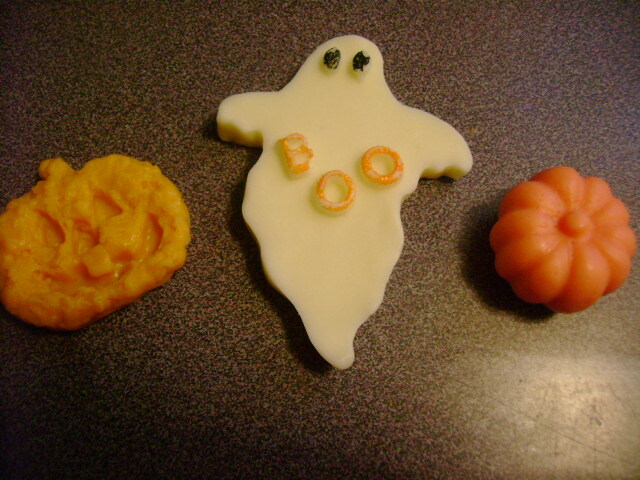 I knew I had to try one of the cute Halloween shapes! The jack o’ lanterns are quite large, just a bit larger than the bottom of my melting bowl. Crosscreek tarts are made of a paraffin blend. The colors were muted and not too bright. 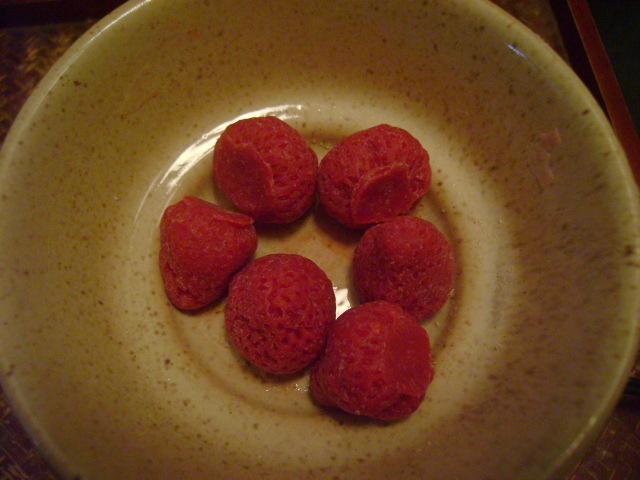 The boldest color was in the red tart I received, and happily it did not leave residue or a stain when I wiped it out of my bowl, as some red wax can do. The tarts were neatly packaged and the labels are simple and neat. Citrus Cream–So when I started melting this tart, I was in my living room doing something or other. I didn’t really notice the scent. But I walked out of the room and came back in–WOW! It hit me pretty good. LOL. This tart made it smell like my whole house had been freshly mopped. It is a nice, clean, lemon with a zesty hint of lime. Rainforest–This was on the lighter side for me. I smelled something powdery in this, which I don’t love, but it wasn’t a strong baby powder type note. I think it came from the floral note. There was also a combination of water and musk I detected. Zucchini Cupcake–My FAVORITE from this selection of tarts. I wish I could tell you guys how yummy this was…I feel my description won’t do it justice. The main fragrance is a STRONG zucchini bread, but it’s the buttery, sweet ZB that I love…it’s not spicy at all. Under the zucchini bread you can pick up the sweet, vanilla, cupcake notes. This was delicious and threw forever. I need more!!! Christmas Kitchen–A unique holiday scent! Many of my faves are rolled up into this tart. The top note is sweet sugar cookie, then you smell this subtle pine, and hints of peppermint. I wish the peppermint was a little stronger in this one, but I enjoyed this scent. 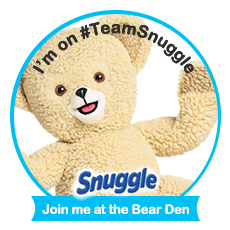 The sugar cookie part was one of the best I’ve smelled…and sugar cookie is a hard scent to get right. It made me want to try her other sugar cookie blends. Happy Halloween Cake–Another great bakery combo! This scent is a perfect mix of candy corn, marshmallow, and vanilla pound cake. You can really smell all three fragrances almost equally! This is actually one of the first candy corn scents I’ve tried where I could actually smell the candy corn. Jack’s Gone Cranberry–A blend of Jack Frost and cranberry. The cranberry is the stronger scent, and it’s a good one–it’s not overly spicy or overly tart. The main note I pick up from the Jack Frost side is menthol, it’s light there under the cranberry. Strong throw, and lasted a while too. I will definitely go back to Crosscreek Country Candles to get some more bakery blends–I think that’s what Deana’s best at! In my opinion, the tarts are a good value too–$8.50 for a 10 scallop sampler pack is nice. Go on over to Crosscreek and check out her awesome tarts, if you haven’t already!! 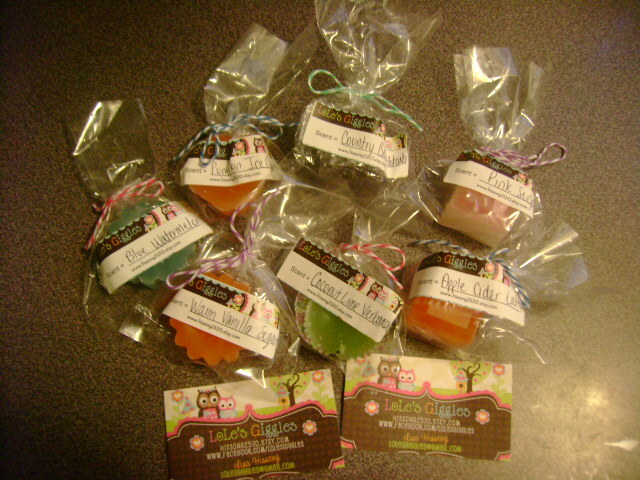 LoLe’s Giggles is a new tart vendor that I was recently intrigued to come across. I had seen Lisa Marie’s page around Facebook before–but I thought she made cute girl items like tutus and bows. Well it turns out, she does–and now she’s making tarts too! First of all, I love the presentation of the individual tarts like this. As a buyer, a pet peeve of mine is getting a cello package that is tied tightly with ribbon that has to be cut off and then cannot be replaced. It is a hassle when you just want to open the tarts to sniff them! These tarts were tied with pieces of dual toned, sturdy cloth string. The strings were not tied in a knot and this made it very easy to open a bag, sniff, and retie the string. I also think the labels are adorable and girly. The label design is colorful, clean and modern. 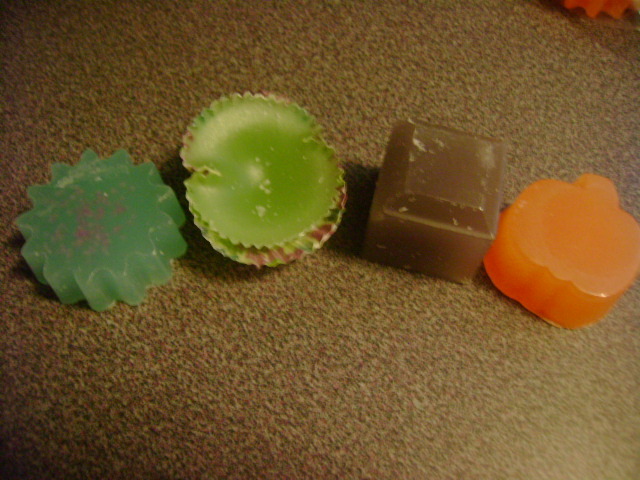 My tarts came in a few different shapes, but my fave was the large cube. It’s about one and a half times larger than a Scentsy cube. The pumpkin was cute too. If you look closely at the blue sun in the left of the photo, you can see pink sprinkles in it. The colors were vibrant without being too bright–have you ever gotten a neon tart that left a stain in your melting bowl after it was poured out? It’s a pain. One unique thing about these tarts is that they are almost translucent looking. I had never seen this before. I think most tarts now are a parasoy blend, which makes for creamy wax. This effect in these tarts was very cool…it made the cubes kinda look like ice cubes. Apple Cider Latte–Mmm, this was yummy. Good throw. Top note of spicy fall apples with a strong cinnamon. The coffee was very, very light in the background. Blue Watermelon–This was unusual…it was definitely a fruity melon mix, but I’m not sure I smelled something I definitely recognized as watermelon in there. I’m not sure what the fragrance oil description is, so maybe it’s a blend of melons. Medium throw. 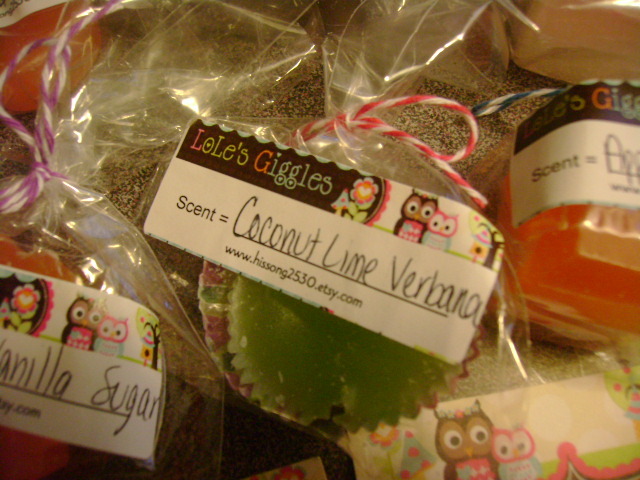 Coconut Lime Verbena–Wow, this scent was soooooo authentic. Coconut Lime Verbena is a Bath & Body Works scent, if you didn’t know that, and this tart smelled JUST LIKE the B&BW real thing. Gave a great throw for hours. Top note is lime, with a creamy coconut background and fresh verbena. Country Berry Hotcakes–O.M.G. I need A LOT MORE of this scent ASAP!! This was definitely the best, strongest pancake scent I have ever tried. It may me one of my new fave scents, period! One cube of this was whole house strong. This scent is a sweet, buttery pancake, with blueberries and maybe strawberry? I’m not sure, but it is AWESOME. Warm Vanilla Sugar–Another B&BW dupe, but this tart was not as good as the Coconut Lime Verbena. I got very little throw out of it–but that seems to happen to me with almost every vanilla scent. Pumpkin Ice Cream–Very nice scent for fall if you don’t like getting hit in the face with all kinds of strong cinnamon. 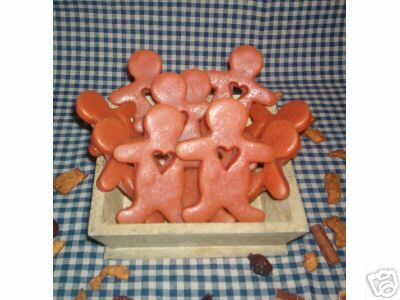 This is a cinnamon pumpkin scent, but it is smoothed out by creamy vanilla. It was strong, though! Southern Lights Candles is a candle shop based out of Tennessee. Luckily, in addition to the store front, you can also buy SLC products online! You can find melts, candles, oils, and adorable warmers for sale on the site. Since all of SLC’s wax products are soy, I was a little concerned that the throw would be very light, as I’m more used to paraffin and parasoy melts. This was not the case at all!! 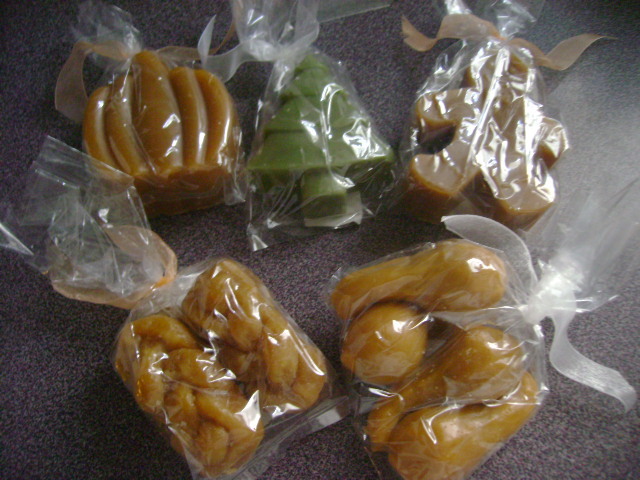 The soy melts come in two different sizes–there are the mini melts, and the regular soy melts. There’s a side by side comparison with mini on the left, regular on the right. I just LOVE the shape of these melts. They are basically the exact size and shape of mini and regular Reese’s peanut butter cups. They peeled very easily from the paper cups, with no residue left on the paper at all. I also like the packaging the individual tarts come in. The labels are clean, simple, and tell you everything you need to know. Now for the good part. On to the scents! 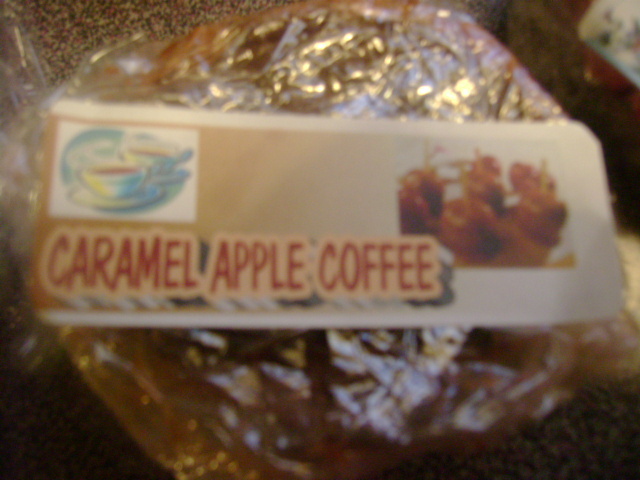 Caramel Apple–Very delicious blend of fresh apples and buttery caramel. This was a lot more apple than caramel for me, but I didn’t mind. The apple was a real, juicy one. Notes of sweet vanilla caramel are in the background. A medium throw. Thanksgiving–A great fall scent! Main note is spicy cinnamon, but there is a buttery pumpkin there as well. This fragrance was very long lasting, it lingered even after I had dumped the tart. I imagine this tart being knockout strong with a little cure time! Lemondrop Cookie–Wow, this is such a yummy fragrance! A bakery lemon, with a sugar cookie note. 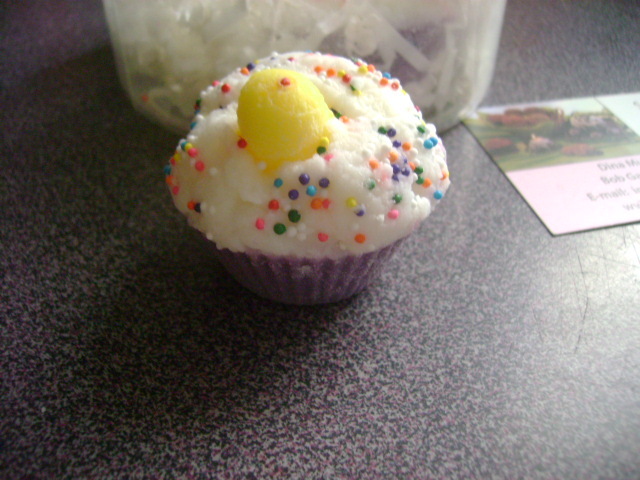 It’s near equal on the lemondrop and cookie parts, with the lemon being a little more prominent. Definitely the favorite out of the scents I tested. STRONG throw! Spiced Cider–Just what its’ name implies. Cinnamon, nutmeg, and other spices on a base of apples and maybe the slightest hint of plums, or berries. A very warm Autumn scent. One mini melt in my warmer lasted for hours. Hummingbird Cake–A unique SLC blend! Hummingbird cake is a very popular dessert in the South. The SLC tart smelled like a sweet, citrus cake. The top note was a bakery orange, with notes of creamy cake and coconut behind it. It made me hungry! I could definitely see myself going back for a big bag of that Lemondrop Cookie! It is probably one of the best lemon blends I’ve ever tried. Couple that with Lisa’s great customer service, and SLC is a winner! Right now, the soy melts are on sale for $1. Give Southern Lights Candles a visit and check them out for yourself! Halo Candle Company has been in business since 1996, but in 2003 it came under new management–Bill and Raquel Lewis. 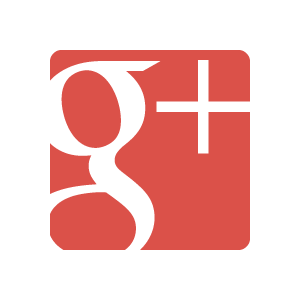 The company is based out of Missouri, but has a few stores scattered around the country. Halo offers candles, wax melts, incense and much more, all with the max amount of fragrance oil you can use in wax. That’s why the products from Halo are called “Extreme Fragrance”! I was so excited to be able to review some wax melts from this company. 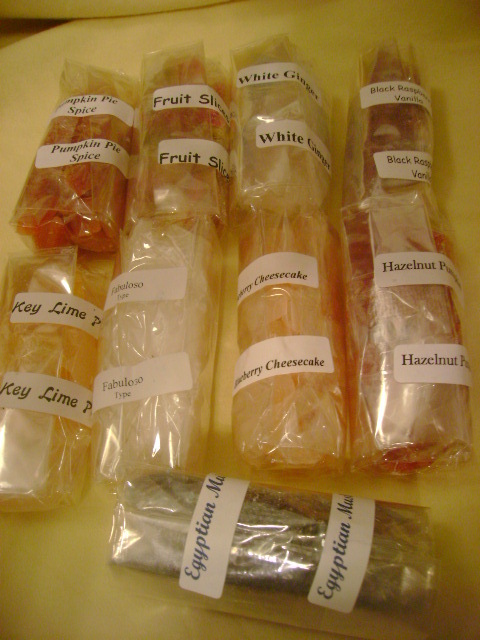 Bill was nice enough to send me 9 fragrances to review: Pumpkin Pie Spice, Fruit Slices, White Ginger, Black Raspberry Vanilla, Key Lime Pie, Fabuloso Type, Blueberry Cheesecake, Hazelnut Pumpkin, and Egyptian Musk. Halo Candle Company boasts a fragrance list of hundreds, so this is just a little sampling of what they have to offer! One of the things I love most about looking at the Halo fragrance list was that there were definitely some unique scents there, ones I had never seen at other companies. Some of these include Azalea, Lizard’s Breath, and Royal Wedding. First of all, I really love the little wax chips I got! 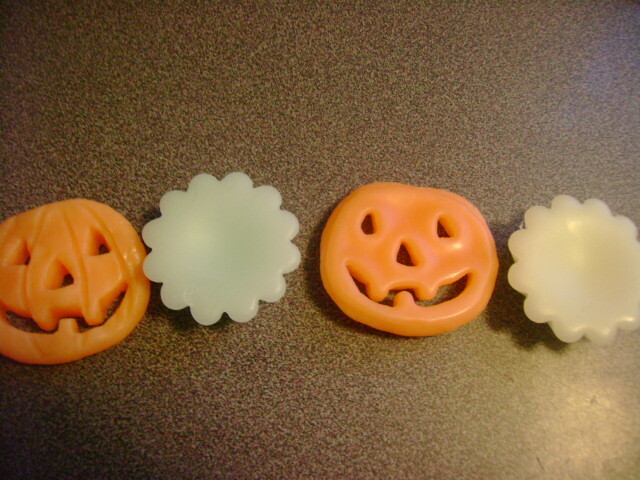 They were a really cute shape, and you get to choose the amount you wish to put into your warmer. You could even order a few fragrances and mix your own scents! 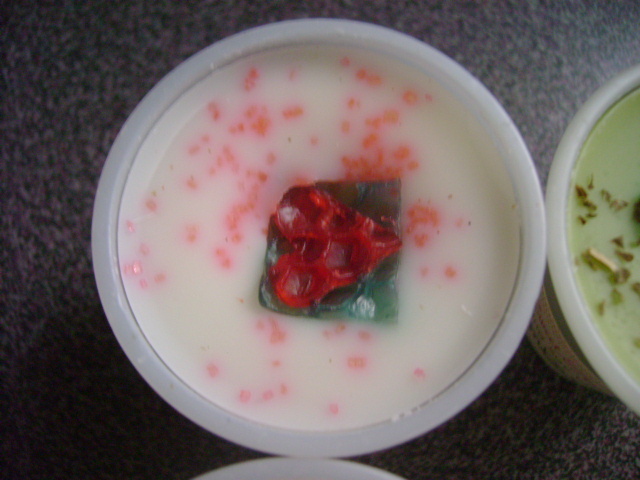 Wax melts in Fruit Slices. In my opinion, the best thing about the fragrances from this company is that they are VERY authentic. Sometimes certain scents are hard to capture in wax form, but the ones I tried all smelled like the real thing. Here are my notes. 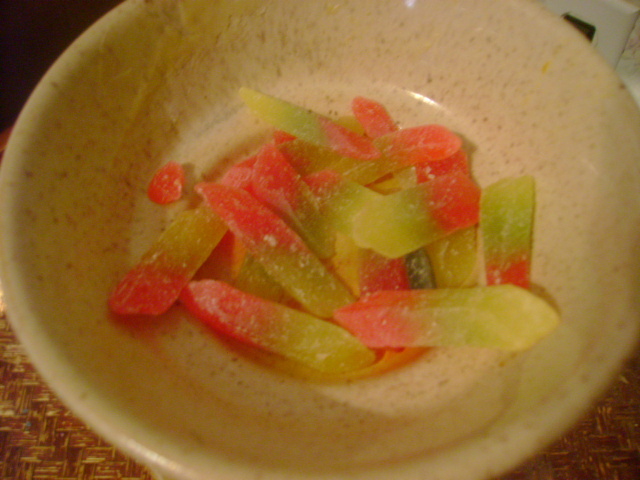 Fruit Slices–A citrus mix that is very bright and summery. You can pick out the separate notes of orange and grapefruit, and there’s also a hint of lemon. Medium to strong throw. Blueberry Cheesecake–Great, authentic blueberry scent with the creamy, tangy cheesecake notes in the background. Fabuloso–Wow, this one is strong! This smells just like the real thing…if you don’t know, Fabuloso is a cleaning product that you can use to mop floors, clean counters, etc. That’s just what this reminds me of–coming home to a kitchen my mom had just mopped when I was a kid. Black Raspberry Vanilla–Delicious fragrance. A very nice black raspberry fruit fragrance, with a small hint of floral in the background. This one was on the lighter side for me, but I really liked the scent. Pumpkin Pie Spice–A classic fall fragrance blend. Cozy and warm spices- there is cinnamon there, but to me it’s not the main note. I also get nutmeg and pumpkin. White Ginger–I wasn’t sure what to expect from this one since I usually don’t like floral scents–but it’s really enjoyable! This is a delicate, spa-like fragrance. Would be awesome in a bath and body product! Egyptian Musk–This is a bestseller for Halo! I thought this would be reminiscent of incense, but it’s not. It is a musky floral scent–quite a strong throw, too. It reminds me of perfume. Hazelnut Pumpkin–My other fave! This is a perfect balance of the nuttiness of hazelnuts and warm pumpkin spice. There is cinnamon but it’s not overwhelming! This was a strong fragrance and it lasted for hours! All in all, I quite enjoyed the wax I got to try from Halo Candle Company. As I said before, their fragrances are some of the most authentic I have tried. Check out their huge fragrance list and I’m sure you will be able to find something you love too! *Note–I was sent these tarts at no cost for reviewing purposes, but that in no way influenced my results. My thoughts and opinions are completely honest and my own. Lynn’s Candles is a small home run business, owned by a very nice lady named Linda Rice. I happened to come across her site one day by chance, and I liked what I saw. Lynn’s Candles makes jar candles, votives, tarts, and many novelty shaped candles such as Coke glasses and dice. A 16 oz. jar candle is $6.99, and you really can’t beat that! Linda was pleased to send me a selection of tarts to review. Let me just say, I am so glad I stumbled across her site! It was REALLY hard for me to choose from her list of nearly 400 scents, but these are the ones I got: Pineapple Cheesecake, Witches’ Brew, Alpine Snow Drift, Sun Breeze, Lemon Pound Cake, Mojito, Pumpkin Crunch Cake, Beach Linen, Caramel Apple Coffee, and Snow Berries. The first thing you might notice, which was really my main problem with the tarts, was that they were packaged in plastic wrap. This is usually a big no-no in the tart world, as certain kinds of plastic can leach the fragrance right out of the tarts. Luckily, I had some spare cello bags from previous tarts I had melted, and repackaged them all quickly. Since these tarts are 100 % soy, they were also kind of soft and a bit crumbly around the edges from being shipped. I popped them in the fridge for a short time after they were repackaged, and they were good to go. The labels are gorgeous, though. Caramel Apple Coffee–Since this tart was by far the strongest on cold sniff (I could smell it before I opened the box), I decided to melt it first. Of course the top note was a very strong coffee, but after a while the coffee mellows out and you can catch the sweetness of the caramel and some of the apple. This lingered in my house for hours even after I dumped it, so I would only order this if you are a BIG fan of coffee scents! I liked it though. Sun Breeze–This tart is named very well. You can smell the bright sunny notes. I would describe this as a floral laundry scent. Very clean, perfect if you want to make your house smell like you just cleaned it even if you didn’t! Snow Berries–I mainly got whiffs of winter berries with a background of pine. This is not a sweet, juicy summer berry scent. There is a bit of cinnamon in the background, but it’s not in your face spicy. Nice, lighter winter scent. Lemon Pound Cake–What a strong throw! This tart definitely freshened my whole house. It is a lot more lemony than it is bakery, and I think this was the first lemon scented tart where I got the “Lemon Pledge” notes that some have described. But, I loved it! Witches’ Brew–This is a very complex blend. Notes I got were cinnamon, apples, grapes, pears, and a little hint of smoke. It would seem that so many notes in one tart would be overbearing, but that was not the case at all. I really like this as a fall scent, and it threw for many hours. 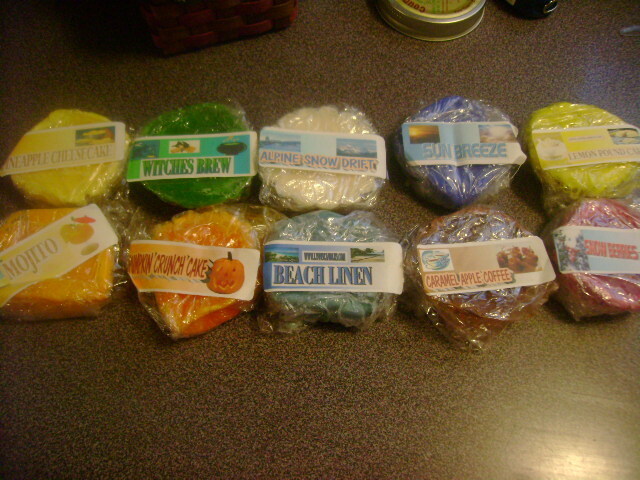 Beach Linen–Another great clean scent. This is a laundry scent, but you can smell the watery notes as well as a light floral aroma. VERY strong throw on this one, I loved it. Pineapple Cheesecake–Sooooo yummy. Main notes are sweet pineapple and tangy, creamy cream cheese. You can also detect the cinnamon honey notes of the graham cracker crust in the background. Medium throw on this one, it wasn’t in my face but I kept getting whiffs of it while it was melting. Alpine Snow Drift–WOW. Definitely my favorite scent of out the ones Linda sent me! A strong blend of snowy, silvery pine, with a slight hint of mint in the background. A perfect winter and holiday scent…I’m not sure how it’s done, but this scent just made me feel like it was winter even though I knew it was 97 degrees out. 🙂 LOVED LOVED LOVED it. Mojito–This would be great for spring and summer! I definitely thought it smelled like a cocktail, but not necessarily a mojito. I could smell the rum, but there were no minty or lime notes. Maybe it was a peach or mango? I don’t think this scent was really mojito, but I liked it all the same. 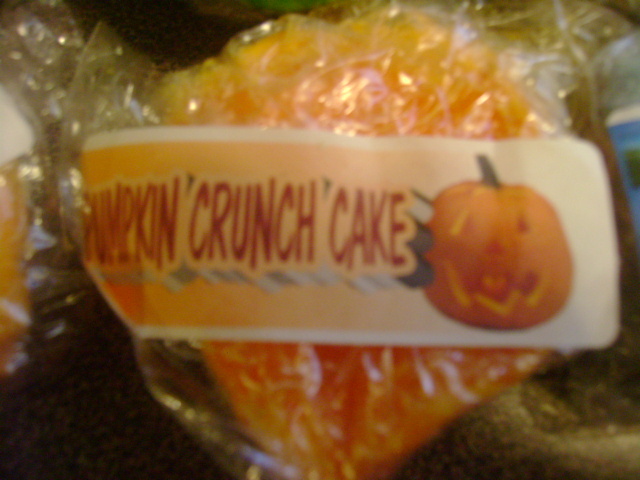 Pumpkin Crunch Cake–Quintessential fall pumpkin scent. Top note of bakery cinnamon, with other spice and buttery cake notes in the background. I really like this and it is still throwing as we speak. I like that it’s strong enough to scent a couple of rooms, but it’s not an eye-burning cinnamon like some others I have encountered. I was really pleased with the selection of tarts I got from Lynn’s Candles. The tarts, as I mentioned, are 100% soy, so I have no doubt if I would have left them to cure longer they would have gotten even better! Linda is a very kind woman and easy to work with, and you can tell she really loves her craft. Head on over to Lynn’s Candles and check out her scent list, it’s massive! Add that to great prices and scents with big throws…you should give Lynn’s Candles a try!